Water supply concerns in Central Texas and the Drought of 2007-2009 have helped spark growing interest in rainwater harvesting as a way to provide water for use on landscapes and gardens, and for pets, livestock and wildlife. Rainwater harvesting was a common method of providing water for many of the first settlers in Texas. 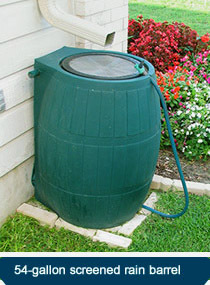 Rainwater harvesting can be as simple as placing a barrel under a roof's downspout to collect water for your plants. Or in a more rural setting where public water supply or good quality water wells are not available, it may include an elaborate system of tanks, pumps and filters that supply both non-potable and potable needs. BUY A BARREL - Attractive and practical rain barrels are increasingly available at home improvement stores and through online order. Most are made out of tough molded plastic resins that won't rust. Some look like a traditional wooden barrel while others are molded to look like clay urns. A few bricks or a wooden stand a few inches high will create some elevation and make it easier to fill watering cans or deliver water by gravity to another location in the yard. 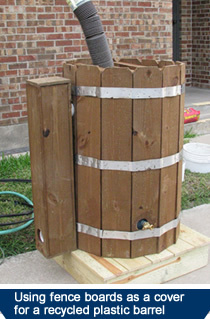 Periodically area organizations offer seminars on assembling your own rainwater harvesting setup utilizing recycled plastic barrels and a few common plumbing fittings. This offers lots of opportunity for creativity. 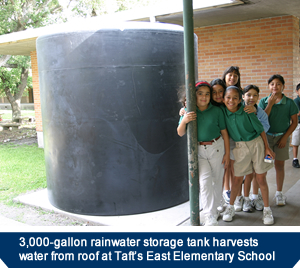 Two or more barrels can be plumbed together to store even more water for those long periods between rainfall in South Texas. WATER QUALITY - Pure, condensed rainwater is practically free of all dissolved minerals and gasses. Even after running off a dusty roof, through a gutter and into a storage barrel, it will have a very low level of total dissolved solids -- far less than in groundwater or water delivered by the Water District through our partner municipalities. Screened storage will provide settling and control mosquito breeding but may encourage algal growth. Simple filtering can remove suspended algae. >> Indoor and outdoor potted plant watering and fertilization. >> Final rinse when washing a car or truck. >> General inside scrubbing (not including food surfaces). >> Auto radiator or windshield washer makeup. You can also use captured rainwater for a drip irrigation system for some parts of your landscaping because it can be applied by gravity alone. Some public and commercial buildings in Central Texas have installed rainwater and air conditioner condensate collection systems for use in drip irrigation systems. The Water District has installed demonstration harvesting projects at the San Patricio County Fairgrounds and at the Welder Wildlife Refuge. A state grant helped with installation of a collection system at East Elementary School in Taft. In operation since 2004, it includes a 3,000-gallon tank and several 75-gallon rain barrels that can be used to water garden areas. THE BOOK - The Texas Water Development Board has prepared an 88-page guide called the Texas Manual on Rainwater Harvesting which is available for review or download here (PDF: 2 MG). RAINGARDENS - A raingarden is an artificial depression in the landscape that collects and stores stormwater runoff until it can infiltrate into the soil. It is not a pond - it should only be a few inches deep and be designed so that it will contain standing water for only a few hours after most rainstorms. Raingardens are usually planted with native vegetation that is hardy and attractive. Raingardens also provide habitat for birds, butterflies and other insects. A raingarden should be placed at least 10 feet from foundations.